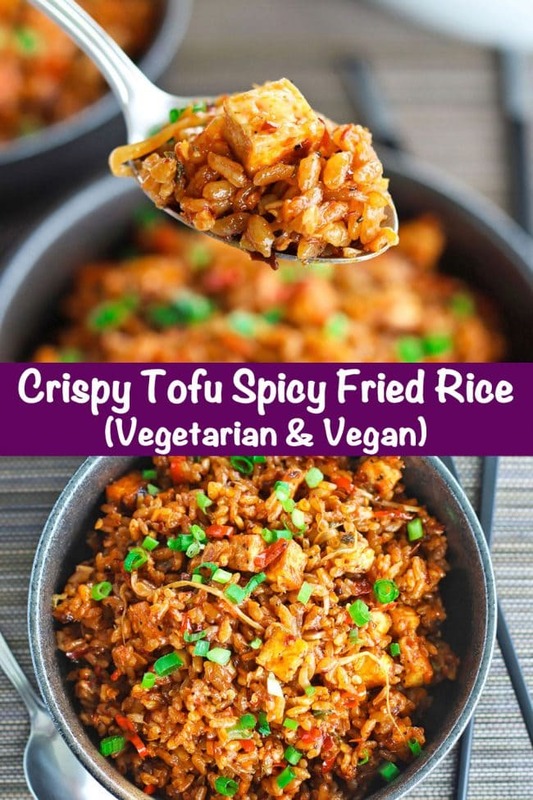 This Crispy Tofu Spicy Fried Rice is easy to make, 100% vegan and vegetarian, and loaded with delicious crispy pan-fried tofu! 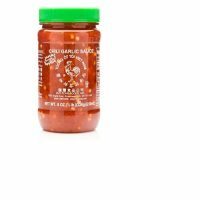 It packs a punch with bold flavors from Lao Gan Ma’s Spicy Chili Crisp Sauce, and is also easily customizable with your favorite veggies. 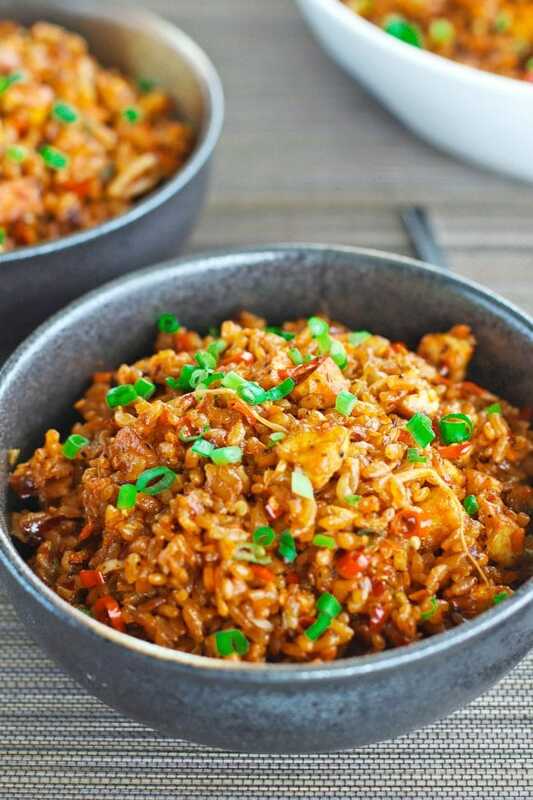 This is one back pocket fried rice that all spicy fried rice lovers NEED to try! 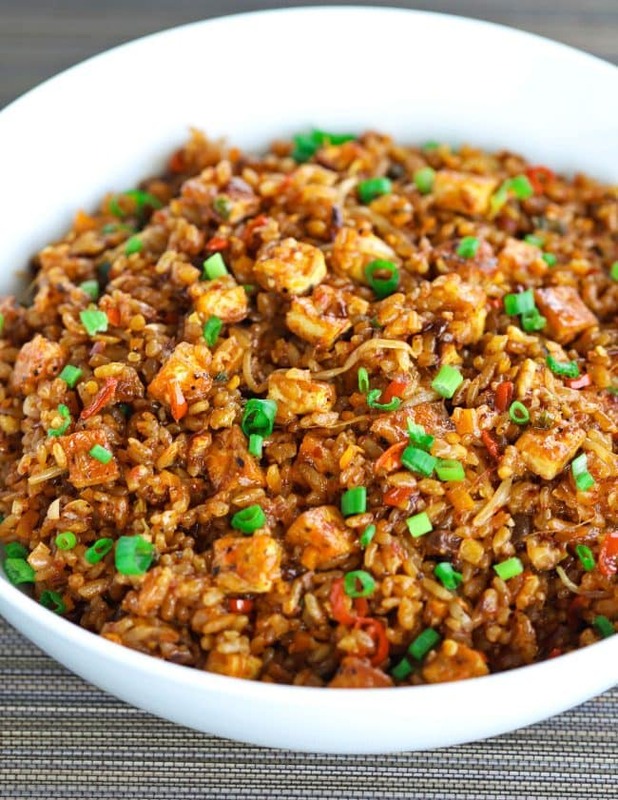 Do you have a favorite fried rice recipe? 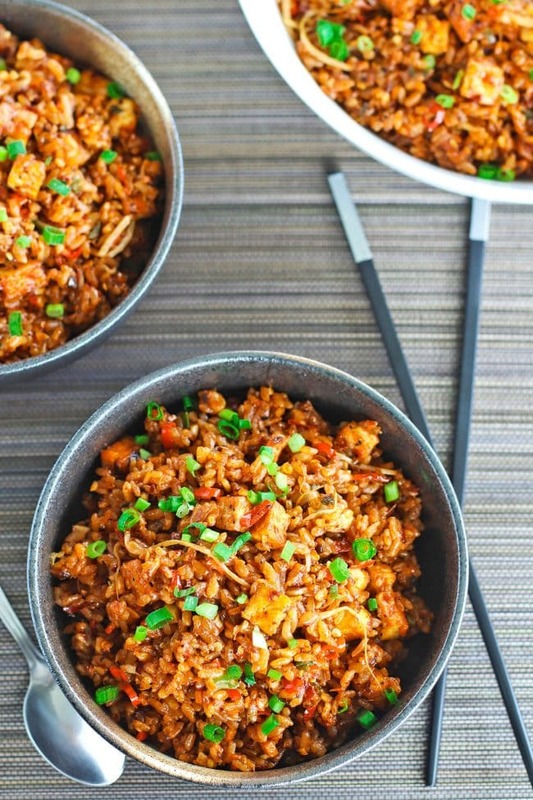 If not, meet the most EPIC spicy fried rice ever! Trust me, you are going to want to bookmark this one! 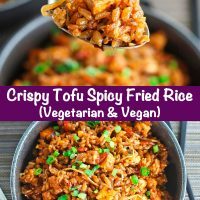 This delicious Crispy Tofu Spicy Fried Rice is one of my all-time favorite weeknight dinners, and I’ve been making it for two+ years now. 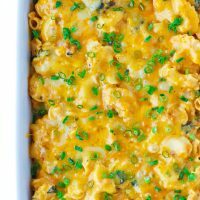 It’s super easy to make, and also completely vegetarian and vegan. And I can honestly say it’s one of the BEST fried rices I’ve eaten in all my twenty-something years! I woke up one morning with a mad desire for spicy fried rice, and I just knew all h*ll would break loose if I didn’t satisfy my craving that day. Does this happen to you guys as well!? It might just be me that goes that nuts over food. 🙄 But anyways, I got on good ol’ Google on that fine day to find some inspiration to make that special spicy fried rice I so badly wanted and needed. And boy, did I find some inspiration on the webosphere! 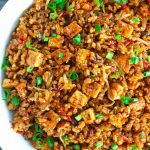 This recipe is a spin on Seonkyoung Longest’s Devil’s Fried Rice (Ultimate Spicy Fried Rice), which I came across about 3 years ago. 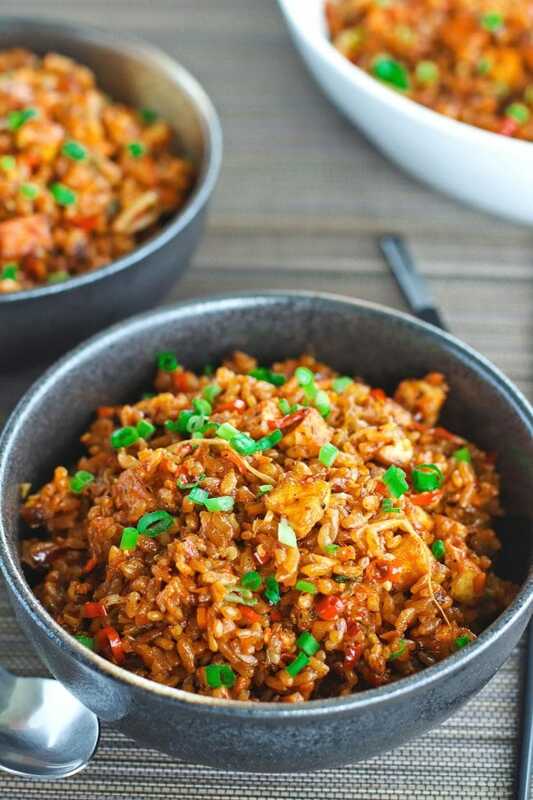 I instantly started drooling in front of the screen as I scrolled down and gazed at the gorgeous photos of her mouthwatering spicy fried rice. 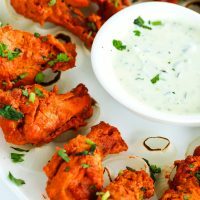 I initially adapted her recipe and made a non-veg version too. But the one I am sharing today is 100% vegetarian and vegan. 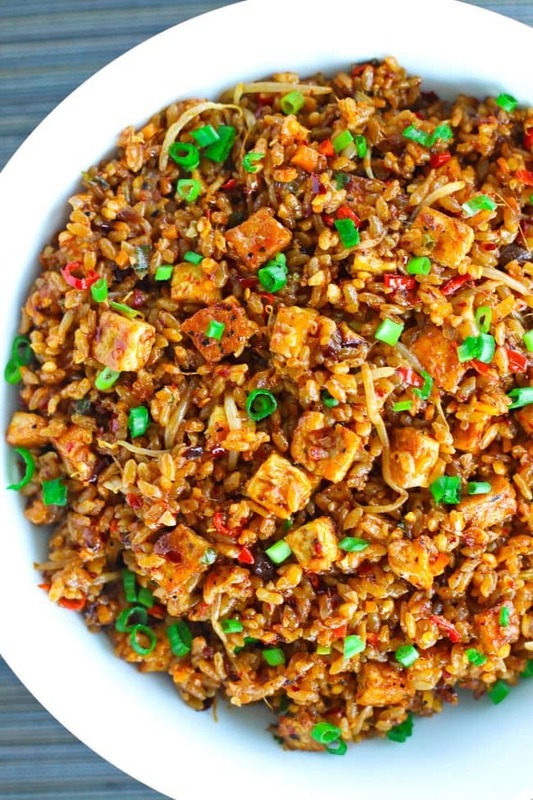 Vegetarians, vegans, and spicy fried rice lovers rejoice! Truth be told, I love it more than my meat version and make it twice as often. Like every two weeks often. And nope, I’m not even remotely close to becoming sick of it because it’s utterly droolworthy and tasty! The killer spicy notes from the sauce, and the salt and pepper seasoned tofu cubes with their crispy on the outside texture and soft insides are YUUUHHH-MMYY! 🤤 I literally have to restrain myself from eating them ALL straight from the pan before I make the fried rice! WHAT’S IN THE SPICY SAUCE? And the show-stopping, HIGHLY addictive, and bold flavored Lao Gan Ma Spicy Chili Crisp Sauce! These four combined together make one helluva sauce! 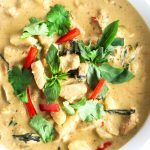 And once the sauce is tossed with the rice, aromatics, veggies, and those divine tofu cubes, you’ve got yourself a bowl of crazy-deliciousness in just 30 minutes (minus the prep time)! CAN I CUSTOMIZE THIS FRIED RICE TO MY TASTE? What I love about fried rice in general is that it’s flexible and easily adaptable to anyone’s taste. You can swap proteins (but we’re not going to because we have magical crispy tofu cubes 😍) and veggies easily. 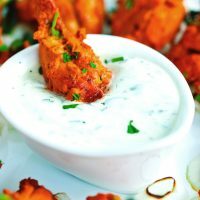 And you can also tinker around with the sauce until the spice level is just perfect for you. I went with carrots, celery, and fresh mung bean sprouts because the combination just felt right that day, and I happened to have them on hand. But if you like, you can add other fried rice friendly veggies like peas, diced red, green, or yellow bell peppers, green leafy Chinese vegetables like bok choy or choy sum, etc. Maybe even throw some broccoli in there! Although this fried rice does involve a bit of prep work with chopping up all the aromatics and veggies, you can chop them all a day in advance to save time. Or if you prefer, buy a back of mixed frozen veggies (corn, peas, carrots, or another combo) at the supermarket and use them instead. CAN I MAKE THIS FRIED RICE GLUTEN-FREE? You definitely can! The only sauce that isn’t naturally gluten-free in this recipe is the light soy sauce. 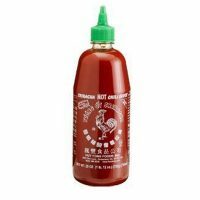 Sriracha sauce, Lao Gan Ma’s Spicy Chili Crisp Sauce, and most Chili Garlic sauces available on the market are all naturally gluten-free. If you need to make this gluten-free, you can swap the Light Soy Sauce for Tamari. Also, double check that the Chili Garlic Sauce you are using is GF certified. 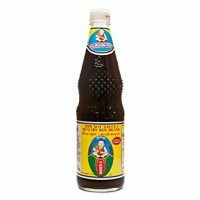 I recommend using Huy Fong’s Chili Garlic Sauce because it tastes really great and is also naturally gluten-free. 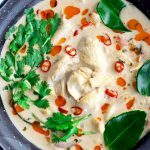 CAN I MAKE THIS FOR MEAL PREP? 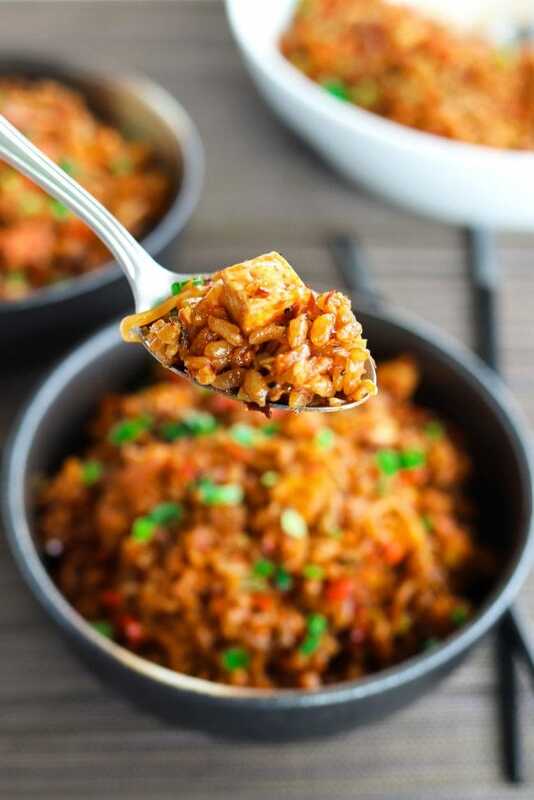 This fried rice is also great for meal prep if you need a few days of lunches sorted. It’s perfect since it has your protein, carbs, and veggies all in one and makes a filling meal! 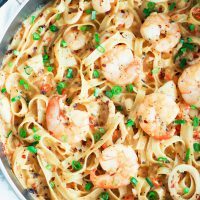 I personally love it as a weeknight dinner because I can cook it in minimal time, and not have to fret about tons of washing and cleaning up to do afterwards! But you can also totally serve this up as a side with your main if you like. And if you’re a garlic fiend like me, go BIG and make this tofu fried rice taste garlicky and spicy amazing! Mwaahh! Need more quick & easy weeknight stir-fry ideas? Here are some of my all-time favorites! 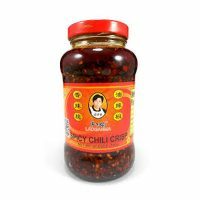 Sauce Bowl: Combine light soy sauce, Lao Gan Ma’s Spicy Chili Crisp sauce, and Chili Garlic Sauce in a medium sized bowl. Mix and set aside. Fresh Ingredients: Chop the garlic, ginger, fresh red chilies, celery, carrot, onion and spring onions (whites & greens separated) and set aside. Tofu: Drain the tofu pack and pat dry the block with paper towels. Gently squeeze out the excess water, then chop into ½” thick cubes. In a large nonstick fry pan, heat 2 tablespoons peanut oil. 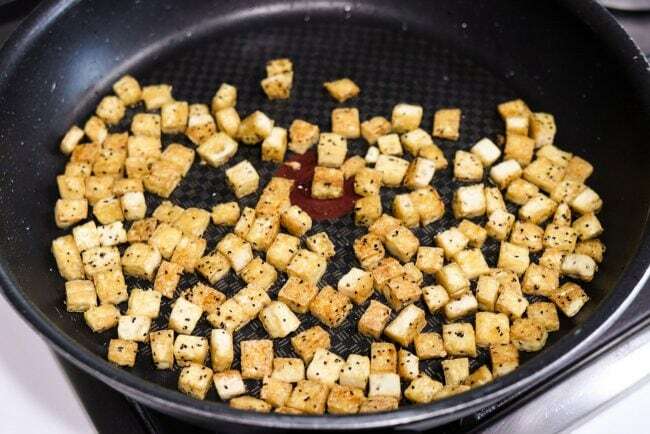 Once the oil is hot, add the tofu cubes. Allow to cook for at least 1 minute without touching them. Then, gently shake the pan by the handle to make the tofu shift position. You’ll see that the bottom will have browned slightly. Season with kosher salt and black pepper to taste, and use a spatula to flip the tofu. Brown the tofu cubes on all sides – about 10-12 minutes. Set aside (you can leave them in the pan and add them directly to the wok of fried rice). In a large wok, heat 2 tablespoons peanut oil, 2 TSP chili oil, and 2 TSP sesame oil. Once heated, add the onions and spring onion whites and cook until the onions are translucent – about a minute. Add the minced celery and carrot and stir-fry until they have softened slightly – about another minute. Add the ginger, fresh red chilies, and garlic. Stir-fry until fragrant for 1-2 minutes. Season with a little black pepper and white pepper to taste and continue stir-frying. Add the cooked rice and pour the sauce all over it. 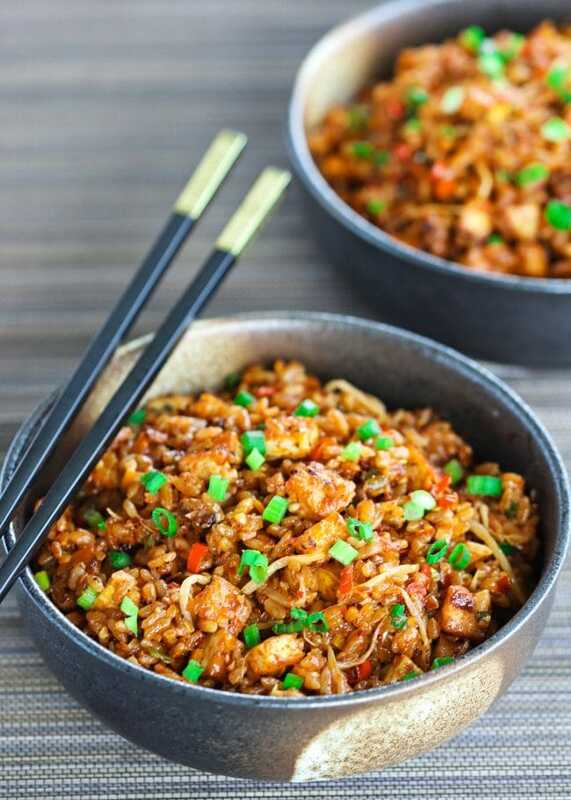 Continue stir-frying for 4-5 minutes to combine, breaking the clumps of rice as you go with your spatula. Once everything is coated in the sauce, add the bean sprouts and top with 1 TBLS Spicy Chili Crisp (optional). 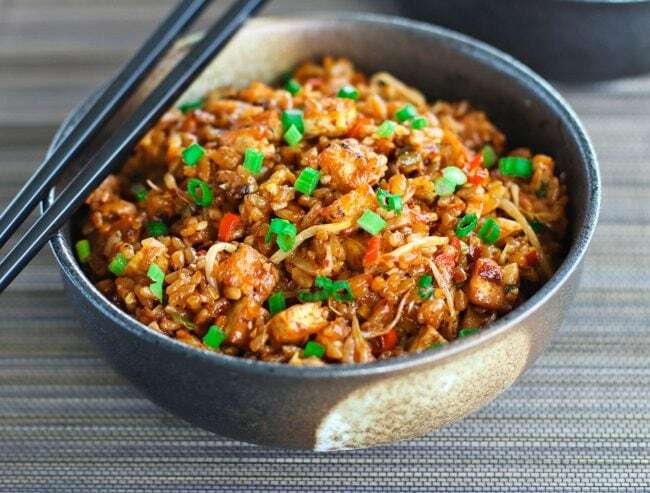 Stir-fry for 2-3 minutes or until they have slightly softened and combined with the rice . Season with more black pepper and white pepper to taste and continue stir-frying. Add the crispy tofu and and continue stir-frying until everything in the wok is combined – about 2-3 minutes. 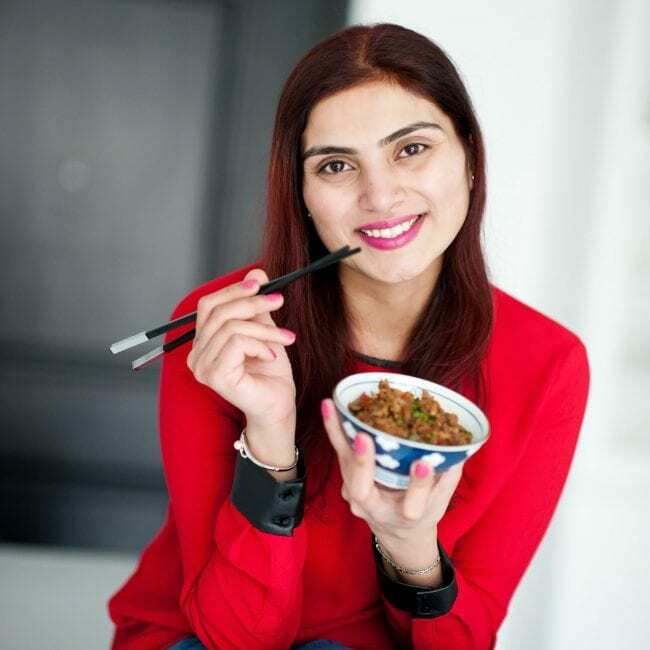 Sprinkle 2/3 of the spring onion greens over the rice and give everything a good stir until they are well distributed. Cook for 2-3 more minutes, then turn off the heat and transfer to a dish (or bowls). To Serve: Garnish with the remainder spring onion greens and serve with more chili oil on the side if desired. 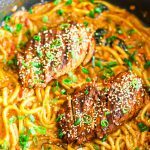 Recipe inspired by Seonkyoung Longest. 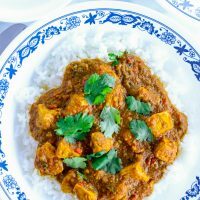 The BEST Indian Onion Chicken Curry!